A Lydd woman with learning difficulties is celebrating making the successful transition from leaving home to leading an independent life. 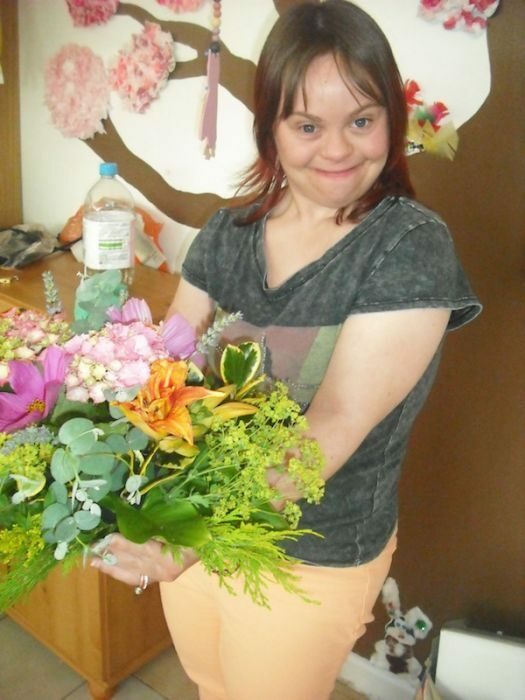 Jodie Farrington Vickers, who has Down’s syndrome, has moved into the nearby Chinook supported living service run by care provider Regard. According to Jodie’s mum Maria Beach, the 27-year-old has taken the move to a new home in her stride and is enjoying every minute. “It’s been a really smooth transition for Jodie and we are so pleased for her. You can see her confidence growing daily,” said Maria. “She is only living 10-doors down but it is a different environment and she is getting more and more independent as time goes on. “The house feels very quiet without her but we know she’s in good hands. The staff at Chinook are so friendly and supportive. Jodie has been coming to Chinook twice a week to a day service for two years and is already friends with her fellow house mates. On Wednesdays Jodie works at the Coterie Tea Room at the Mariners in Rye which offers training opportunities for adults with learning disabilities. Jodie is shortly set to receive a City & Guilds catering certificate from the Canterbury Oast Trust who runs the Mariners. Meanwhile on Mondays and Tuesdays she attends The Shed day centre in Hythe which provides in-house activities and regular trips into the community. When she’s not out and about Jodie enjoys playing on her Karaoke machine and likes to meet up with her brothers Josh and Harry. Jodie is one of seven individuals who live at Chinook which provides 24-hour staffing support to help people live as independently as possible. People who live at the service are involved in the day to day running of their home from deciding menus, shopping and cooking to laundry and gardening. Regard is the UK’s fourth biggest care provider and holds a prestigious Gold Investors in People standard. For further information visit: www.regard.co.uk or for referrals call: 0800 840 0313. Be the first to comment on "Jodie takes independence in her stride"